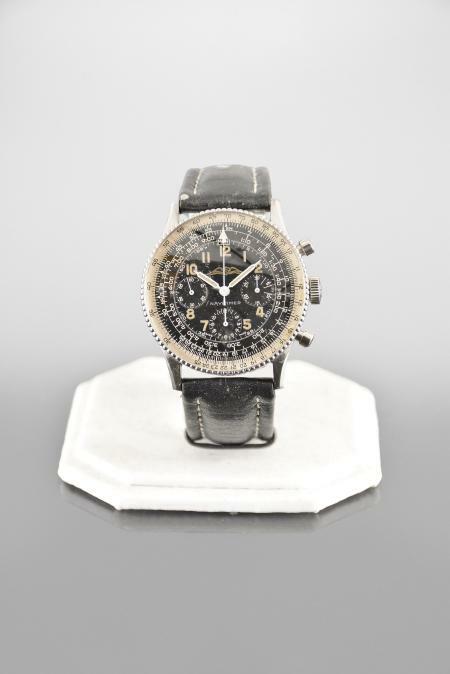 DESCRIPTION: Breitling Watch Co., Switzerland, a rare pre 806 "Navitimer" wrist chronograph, 17 jewels, manual winding, gilt plate Valjoux 72 movement with lever escapement in a stainless steel case with beaded, rotating bezel and leather strap, luminous arabic numeral black dial with AOPA logo, hour and minute registers and constant seconds, luminous hour and minute hands, serial #839210, 40mm, c1955, with associated Breitling box. CONDITION:CASE: Minor, fine pitting; Some polishing and regraining; Back regrained and with wear; Underside of two lugs with burrs; Back with a few marks from case knife; Plastic crystal with minor scratches; Chronograph pushers and tubes replaced; Strap with residue from inside of box. DIAL: A few minor marks and scratches, tiny spot of corrosion at 9:00, otherwise very good. HANDS: White paint refreshed; Chronograph hand replaced. MOVEMENT PLATES: Minor marks and scratches on plate; Some steel components with a few specks of oxide; Some screw heads with minor marring. MOVEMENT FUNCTION: Running order (winds, sets and ticks) . COMPLICATION FUNCTION: Functions properly. Box with scuffs and losses. 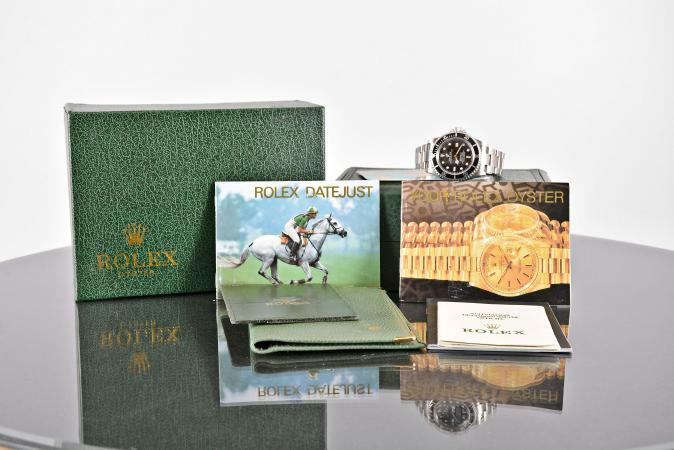 DESCRIPTION:Rolex Watch Co., Switzerland, ref. 16600 "Sea Dweller", cal. 3135, 31 jewels, automatic winding, adjusted to 5 positions and temperature nickel plate movement with lever escapement and free sprung micro stella balance in a stainless steel case with triplock crown, gas escape valve, unidirectional rotating bezel and ref. 93160A bracelet, luminous black dial with date aperture at 3:00, luminous, polished steel hands, serial #P496478, 39mm, c2000, with associated box and papers. CONDITION:CASE: Minor dings; Very fine scratches on outer surface of case; Crystal with minor scratches; Bracelet with minor scuffs and scratches. DIAL: Very good. HANDS: Very good. MOVEMENT PLATES: Very good. MOVEMENT FUNCTION: Running order (winds, sets and ticks) , would benefit from service. Outer box good, with minor lifting of covering, inner box very good. DESCRIPTION:Patek, Philippe & Co., Geneva, a gold Calatrava ref. 2484 wrist watch, 18 jewels, cal. 10 - 200, manual winding, adjusted to 5 positions, temperature and isochronism, cotes de Geneve decorated nickel plate movement with lever escapement, monometallic balance and whiplash micrometric regulator in an 18 karat, yellow gold case with engraved presentation on back and black lizard grain strap, baton marker silver dial, gold baton hands, serial #741075 (movement) , 682663 (case) , 32mm, 36g TW, c1955, with associated Patek Philippe box. CONDITION:CASE: Small dings and pin pricks; Fine scratches on outer surface of case; Plastic crystal; Underside of two lugs with localized wear; One lug with number scratched into underside; Precious metal content marked. DIAL: A few fine scratches; minor spotting. HANDS: Good. MOVEMENT PLATES: Minor scratches on plate; Bright work with fine scratches. MOVEMENT FUNCTION: Running order (winds, sets and ticks) . Box very good.